This is critical to anyone creating large paintings at a professional level. The same concepts also apply to smaller paintings that will take multiple sessions to complete. The two videos are from my TV show, where I was filmed live as I painted a large canvas from start to finish. These are the same techniques I used when creating three recent 5-foot-wide commissioned paintings now permanently installed in the lobby of the Civic Center. How to produce paintings with “wall power” for better sales. 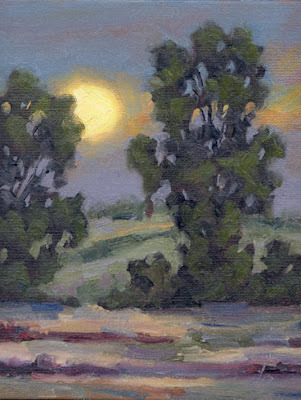 How to create a sense of cohesiveness and continuity in your paintings. The two critical viewing distances, and how to handle them. How to wrap up a painting session so that the next session will flow better. Important advance preparation to handle before picking up a brush. What keeps collectors coming back for more of your paintings. Plus much more. The special offer price is $50, with free shipping to anywhere in the USA. This special “Painting BIG” package also makes a unique Holiday gift for your artist friends! To order, email me at: tombrownstudio@cox.net. 1. Put a link in your posting (or on your blog) to the person who tagged you. 3. Tag 7 other bloggers at the end of your post and comment on their blogs to let them know they have been tagged. "Moonlight Memories" reminds me of when I was little and living in Minnesota - beautiful country and a beautiful painting. P.S. I am putting your video on my wish list for Christmas. Just wanted to tell you that I received your new package - DVDs and printout - Painting Big. Wow, it's wonderful! Got it yesterday, read the print out and started watching the first DVD and I couldn't be happier. Over the years I've taken lots of college level art and painting classes and I thought I knew what "fat over lean" meant but realized, after your explanation I've had it wrong all of these years. I can't thank you enough for that one - the light bulb went on and I know my paintings will improve. Happily, there was so much more - for instance oiling the canvas, how great is that? What a time saver -can't believe I never thought of that myself. :o) Not only are you a wonderful and creative painter, but you are also an incredible teacher and I thank you for making these lessons available to us out here in cyber land, and at such a reasonable price. I've never spent a better $50. Thanks so much!